On Friday, August 17, 2012 I arrived at Pier 66 in Seattle, Washington to board the Celebrity Infinity cruise ship. The cruise was headed for Alaska. 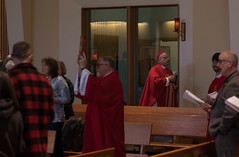 The cruise had been arranged as an opportunity to familiarize people throughout the “lower 48” to life and ministry within the Diocese of Juneau and Southeast Alaska. Our group consisted of people from Washington, DC; Dallas, TX; Pittsburgh, PA and Juneau, AK. After a day at sea, we arrived at Ketchikan. There we were met by parishioners of Holy Name Church who shuttled us to the 9:30 AM Mass on Sunday. The parishioners served a splendid pancake breakfast as our guests were able to visit with “the locals”. As we returned to the ship, I celebrated a 5:30 PM Mass on board for the passengers as well as a 10:30 PM Mass in the lower section of the ship for the crew members. The Mass for the crew was a welcomed experience. At about 10:25 PM on Sunday I was escorted from my cabin to a lower level section of the ship to the officer’s dining room where the crew had set up the chairs and tables for Mass. 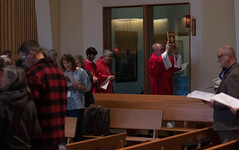 A good number of crew members were waiting for the Eucharist to begin. They were from all over the world – India, the Philippines, South America, Haiti, etc. It was apparent to me that being far away from home, family and friends would be a significant challenge. It also seems to me that many of them are invisible to both the passengers on board or to the people in the towns they stop to visit. 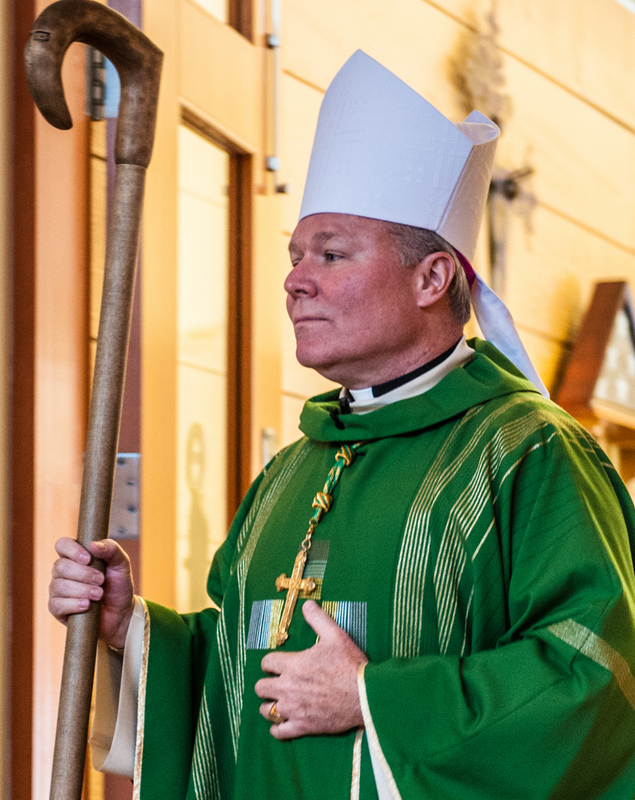 I offered to them and to their colleagues the presence and hospitality of the Catholic parishes of Southeast Alaska. After we cruised through the night, we were met with breathtaking views of Tracy Arm on Monday morning. Later that beautiful afternoon, I stood on the deck as this vessel cruised through Gastineau Channel in our approach to Juneau. The ship anchored in the middle of the channel with the tenders shuttling us to the dock. Our group visited the Cathedral of the Nativity of the Blessed Virgin Mary – the smallest Catholic Cathedral in the United States. After a brief tour through town we went out to the Shrine of St. Therese for Mass, made a brief stop at Mendenhall Glacier and concluded the day with dinner at my house with parish and diocesan staff. On Tuesday we arrived in Skagway and were met by Father David Swantek, a fine young priest who is the Catholic chaplain at Princeton University spending his second summer in Skagway’s parish of St. Therese. After a train ride on yet another spectacular day, we had Mass at the parish and the parishioners provided a wonderful potluck luncheon. The master of the Celebrity Infinity, Capt. Michael Sympouras, graciously invited me to join him at the Captain’s table one night for dinner. He also extended an invitation to take a tour of the bridge and witness first-hand the technology involved in navigating such a vessel through our waterways of Southeast Alaska. It was impressive to see the care and concern taken in navigating such a behemoth craft through our area. The captain explained that the ship’s two propellers are able to turn 360° independent of each other and three thrusters on each side assist with the docking. The Captain explained how the navigational screens are able to identify other boats with an AIS program (Automatic Identification System). This information includes a description of the boat, what it was carrying, the state of the vessel (whether it is underway or stationary), its length and other intriguing facts. In asking the Captain about environmental issues, the Captain shared that their ship used a purer fuel with lower sulfur levels and that all waste was collected onboard and sorted for recycling. He indicated that when the ship makes a stop in Victoria, BC, trucks take the recyclable items to waste management sites. I asked him what he liked most about stopping in Juneau and he said that he always likes it when there is dock space available. With regards to the presence of wild life, he said that extreme caution is given to such things as a pod of whales. As we celebrate Labor Day weekend, I am mindful of the people who make their living on the waters and those who work in connection with the tourist industry. From this experience, I am mindful of all the longshoremen docking these cruise liners and the crew on board. In addition to them, I think of the others who serve our seasonal guests – the bus drivers, airplane/helicopter pilots, the train conductors & engineers, shop owners & workers, as well as a host of others who work in making the Alaskan experience a memorable one. We docked safely back in Seattle and concluded our Alaskan cruise. It was a different perspective for me since I see these cruise ships every day during the summer. It gave me a greater appreciation for the men and women who work in tourism. Being a tourist in one’s own town was a pleasure, but the benefit to our communities as a result of the economic and social contributions of these workers is a real blessing.